Catch the Garden Rhapsody light and sound show and see the trees come alive! 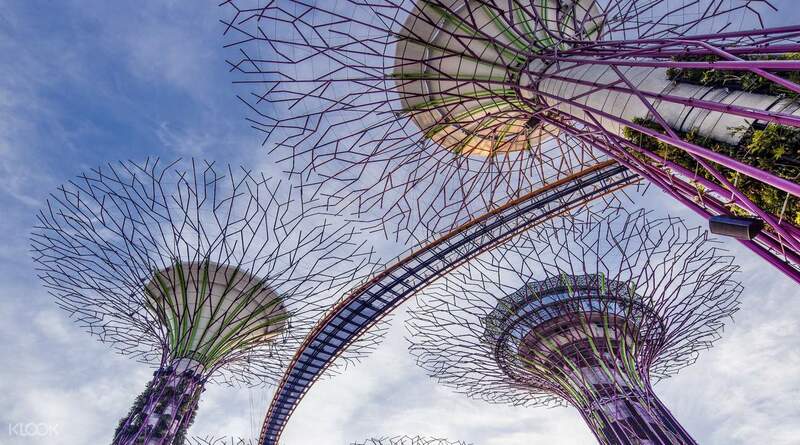 Complete your travels in Singapore with the city’s absolute must-see: OCBC Skyway and Gardens by the Bay. OCBC Skyway is a 128 meter long aerial walkway 22 meters off the ground offering stunning scenic views of both the city of Singapore and the futuristic forest of Gardens by the Bay. 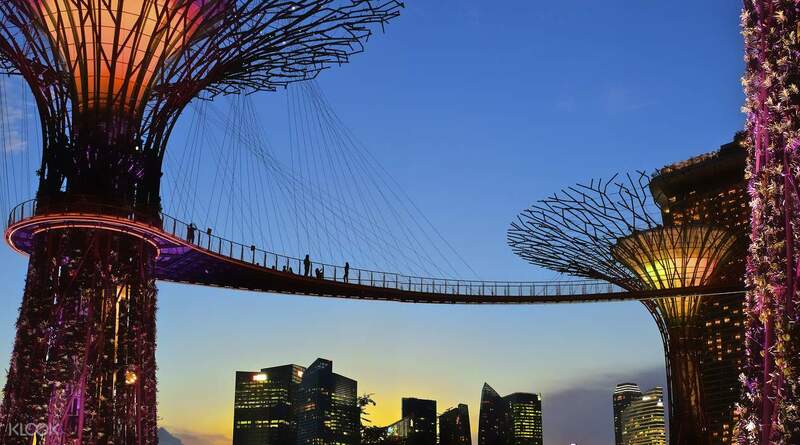 Get up close to the majestic Supertrees and take beautiful pictures. As the night falls, the enchanted trees come to life for a unique performance of light and sound - Garden Rhapsody, performed twice a day at 7:45pm and 8:45pm. Enjoy breathtaking views of the Singapore skyline and its prime sights: Marina Bay Sands, Singapore Flyer and more! Please visit the official website of Gardens by the Bay for the complete schedule of the conservatories' maintenance dates. You don't want to drop by when the attractions are closed! We were very suttisfied with the Gardens, the multitude of flowers, high of the trees, the good organisation and the cleanliness. The distance between the tickets and the Gardens is quite hight regarding the wet weather Althout there is a large number of visitors, the acces to the objectives was quick. We were very suttisfied with the Gardens, the multitude of flowers, high of the trees, the good organisation and the cleanliness. The distance between the tickets and the Gardens is quite hight regarding the wet weather Althout there is a large number of visitors, the acces to the objectives was quick. Having ourselves in the Gardens by the bay is a great experience. When we first enter the garden, it's like we are not in the city because the place is full of greens. Cloud forest and flower dome is great for we have seen species of other plants and flowers that is first to us. Ocbc Skyway and the sound and light show is very entertaining. Will probably be coming back again. Having ourselves in the Gardens by the bay is a great experience. When we first enter the garden, it's like we are not in the city because the place is full of greens. Cloud forest and flower dome is great for we have seen species of other plants and flowers that is first to us. Ocbc Skyway and the sound and light show is very entertaining. Will probably be coming back again. Pretty good experience. The Flower Dome and Cloud Forest were both nice. Do not get the OCBC Skyway pass if you have fear of heights. It could get shaky midway. It has a very good view of the surrounding. Pretty good experience. The Flower Dome and Cloud Forest were both nice. Do not get the OCBC Skyway pass if you have fear of heights. It could get shaky midway. It has a very good view of the surrounding. i stay this place all day. everywhere so much beautiful. i went to the odbc walk on 20:00, there is a beautiful show. you must book time before go up to odbc walk. i book last round (at 9 pm.) this place so beautiful in the night. i stay this place all day. everywhere so much beautiful. i went to the odbc walk on 20:00, there is a beautiful show. you must book time before go up to odbc walk. i book last round (at 9 pm.) this place so beautiful in the night. nice experienced.. so enjoyed the activity, cloud black forest, OCBC Skywalk, Flower Dome and The Garden is so huge and big.. For me one day is not enough to explore everything inside.. me gonna repeat again.. Tq KLook for the express boarding ticket that we dont need to que line up and just show the barcode.. tq KLook and please do often sales and discount for ticket.. nice experienced.. so enjoyed the activity, cloud black forest, OCBC Skywalk, Flower Dome and The Garden is so huge and big.. For me one day is not enough to explore everything inside.. me gonna repeat again.. Tq KLook for the express boarding ticket that we dont need to que line up and just show the barcode.. tq KLook and please do often sales and discount for ticket.. The Red Dot Design Museum which we redeemed our tickets is located a bit distance from Garden by the Bay. From here one can opt for either a bus ride or by foot via the Marina Sand bay front to reach the venue. Flower dome happened to exhibit tulips during the time of our visit which showcase a variety species of tulips in variant colors. Crowd was pack during weekend so expect queueing time at forest dome and OCBC skywalk. The skywalk offers a breathtaking view of Sand Marina bay skyline & Singapore flyers, couple with the state of the art laser lights & music show it was an entertaining and definitely unforgettable experience for us. The Red Dot Design Museum which we redeemed our tickets is located a bit distance from Garden by the Bay. From here one can opt for either a bus ride or by foot via the Marina Sand bay front to reach the venue. Flower dome happened to exhibit tulips during the time of our visit which showcase a variety species of tulips in variant colors. Crowd was pack during weekend so expect queueing time at forest dome and OCBC skywalk. The skywalk offers a breathtaking view of Sand Marina bay skyline & Singapore flyers, couple with the state of the art laser lights & music show it was an entertaining and definitely unforgettable experience for us. It so beauty. 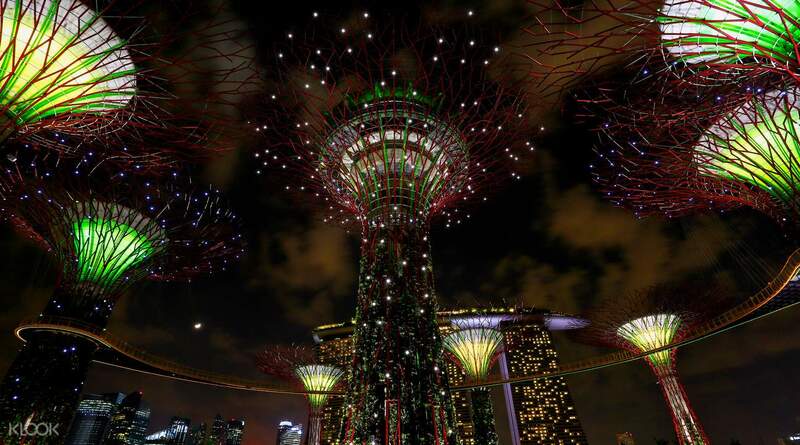 From flower Dome to Cloud Forest and finally enjoying at Supertree Grove via OCBC skyway. It take a long walk in a whole place include a way to redeem combo ticket at Red Dot museum. You will be satified afterall. Thanks Klook for this journey. It so beauty. 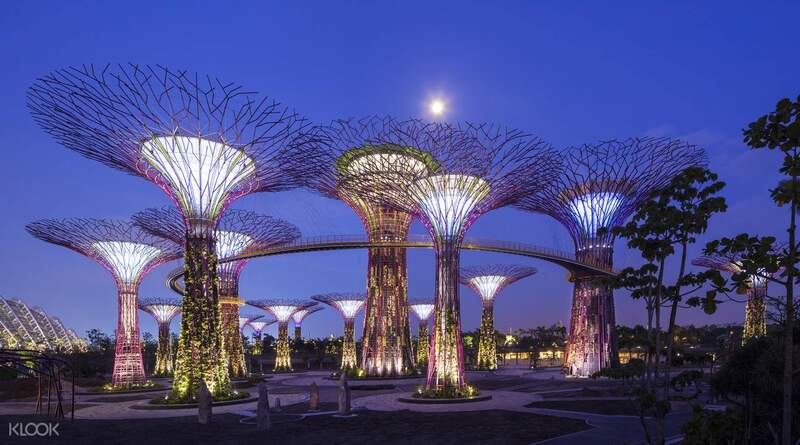 From flower Dome to Cloud Forest and finally enjoying at Supertree Grove via OCBC skyway. It take a long walk in a whole place include a way to redeem combo ticket at Red Dot museum. You will be satified afterall. Thanks Klook for this journey. Not to miss. although prepare for the hot humid weather if you visit in April. Bring umbrella too. It rained when we visited the skyway. Bring jackets for the flower dome and cloud forest. Red dot museum was also a good stop. Not to miss. although prepare for the hot humid weather if you visit in April. Bring umbrella too. It rained when we visited the skyway. Bring jackets for the flower dome and cloud forest. Red dot museum was also a good stop. Great experience but gentle reminder to obtain your “time ticket” at OCBC ticket counter when it’s busy. You will not be able to get on to skyway unless you got your time ticket, specifying the allowed time you can get in. Great experience but gentle reminder to obtain your “time ticket” at OCBC ticket counter when it’s busy. You will not be able to get on to skyway unless you got your time ticket, specifying the allowed time you can get in.